The Abaco Islands consist of islands and cays that form a 120-mile–long chain but no more than 4 mile (average) in width and stretching over 650 square miles. “The Abacos” is a boater’s paradise, well known for shipbuilding offering a very simple and quiet lifestyle. There are no casinos and no shopping malls but you will find great fishing, spectacular beaches, entertaining beachfront restaurant & bars and very friendly people making it the ideal place for those wanting to get away from the city-life and enjoy the finer things in life. It is known for uncrowded beaches that showcase color seen no where before with vibrant crystal clear turquoise blue waters and white powdery beaches. Its colorful colonial architecture where some towns still have pedestrian roads and everyone gets around via golf courts is also a unique feature seen in Abaco. One of the most inhabited towns throughout The Abaco Islands is Marsh Harbour. It is the largest and acts as the commercial hub for the other Abaco islands. Treasure Cay boasts miles of pristine beaches and was once voted top 10 best beaches in the world. Elbow Cay and Green Turtle Cay are old English Loyalist settlements, where you’ll find nicely preserved colonial architecture with a touch of Bahamian pastels, of course. 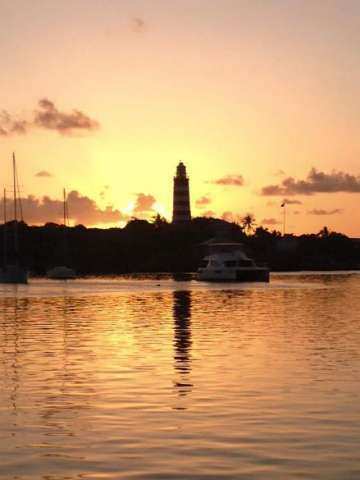 Guana Cay is famous for Sunday barbecues atop the island’s tall sand dune, which overlooks a magnificent 7-mile–long beach.